Sesimbra is a very popular town for the Portuguese to visit, but also for tourists. But where is Sesimbra and how do you get there? What exactly is so special about Sesimbra? We will answer all these questions and more below! Sesimbra is part of the Setúbal district. It is close to the Setúbal bay and has a natural harbour. It is also close to the Sado River. Sesimbra is only 30 minutes from Lisbon, so if you’re staying in Lisbon, you can go there for a day trip. You will need a car or you can get a bus or taxi. 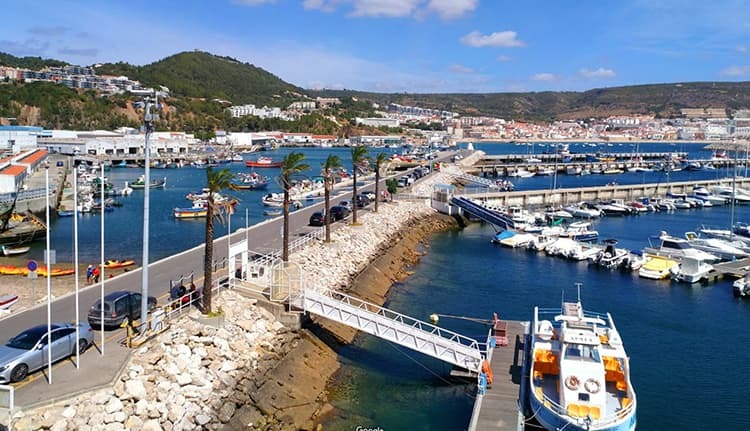 From Lisbon, cross the 25 April Bridge (“Ponte do 25 Abril”), continue southwest to Setúbal and at the junction, N378, head directly to Sesimbra. Here is a Google map to help you. If you prefer not to drive, you can take the Metro to São Sebastião (Red line), switch to the Blue line in the direction of Amadora Este and get off at the next stop, Praça de Espanha. Then catch the 207 bus to Sesimbra. The bus runs every hour and takes about 45 minutes. For more information on the bus times, check the Transportes sul do Tejo’s website. There are so many things to see in Sesimbra! 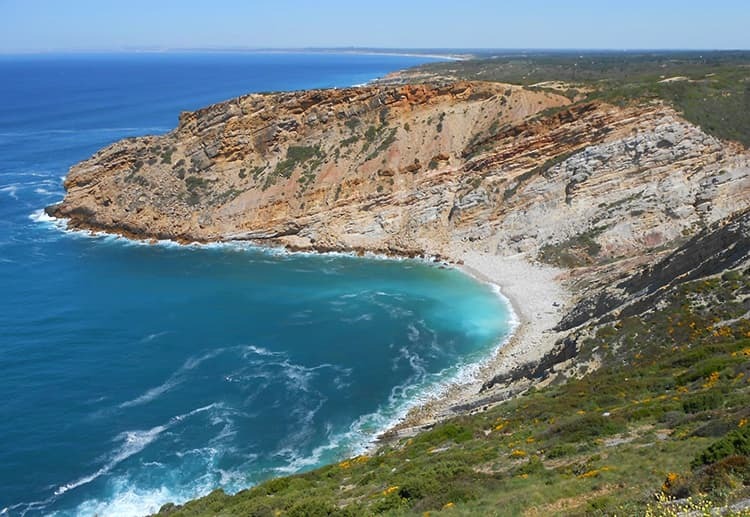 From the castle to the dinosaur tracks… you can be sure that there is a something for everyone going to Sesimbra. Here are a few highlights you should not miss in Sesimbra. Sesimbra is home to a Moorish castle. 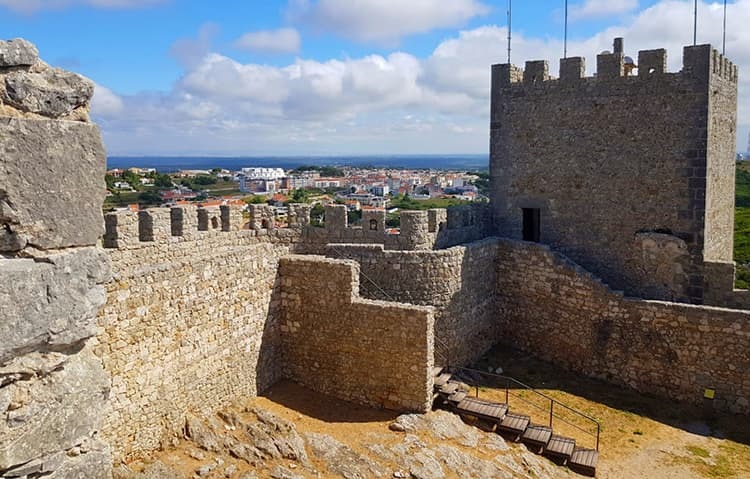 Sesimbra Castle‘s position was very important for the defence of Portugal and the castle was one of the first victories for the Christian conquest of Portugal over the Moors in 1165. The castle received repairs in the 1930’s. The castle stands 230 metres (755 feet) above the fishing village and has amazing views. Inside the castle there are battlements and a church. It’s one of the most visited monuments in the area and well worth it. Sesimbra has a huge fishing heritage and it has a very busy fishing harbour. Sesimbra is mainly a fishing town so the fish in the seafood restaurants is always fresh. The marina is also a very popular place to relax. A short drive to the western point, you will find Cabo Espichel which has amazing cliffs, is home to a pilgrimage church, a lighthouse and wait for it… dinosaur footprints and tracks!!! It is definitely a place to visit while you are in Sesimbra. To the east of Sesimbra town, is Serra da Arrábida where you can find beautiful beaches hidden by lavish hills. It’s a great place for hikers and cyclists. For those looking for some adrenaline, you can do kayaking along the coastline of cliffs, caves and beaches. 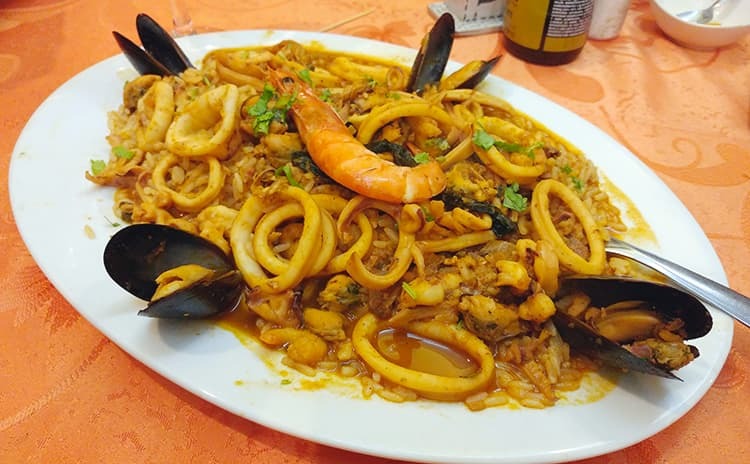 Once you’ve done all the walking and sightseeing, why not stop and have Sesimbra’s speciality dish: Arroz de Marisco (seafood rice). It is great for a group of four to five people and perfect for those who love seafood. After that have a wine tasting session at Bacalhôa Vinhos de Portugal or José Maria da Fonseca. The Setúbal region is famous for their wine especially red! Find out more about Portuguese wines here. The beaches in Sesimbra are beautiful and are great for families and small children. The waters are clean and very calm. There are beaches within walking distance of Sesimbra such as California Beach (“Praia da Califórnia”). Another group of great beaches (and considered to be some of the best in Portugal) are in Portinho da Arrábida about 30 minutes by car to the east of Sesimbra town. The waters are incredibly calm, and the beaches are close to the National Park. It can get busy in the summer though. Like this article so far? Subscribe to our newsletter. so you don’t miss more tips and advice about visiting Portugal. When is the best time to visit Sesimbra? Sesimbra is hot during the summer, but it is pleasant during spring and autumn. It can be cold in the winter though so be prepared. Sesimbra’s high season starts from June until August which is when it gets really busy. Sesimbra is open all year though as the cafés, bars and restaurants don’t shut. Where to stay in Sesimbra? Hotel dos Zimbros is an amazing hotel with an outdoor pool and a terrace overlooking the Atlantic Ocean. The hotel has free wifi and air-conditioned rooms. A breakfast buffet is served daily. Prices start at €110 per night. Hotel dos Zimbros Sesimbra, Portugal. All rooms at the Sesimbra Hotel & Spa have air conditioning, flat-screen cable TV, free wifi, a safe, a mini-bar and a private balcony. The Spa offers a wide variety of health and beauty treatments, such as a hot stone massage. Other Spa facilities include a small heated indoor swimming pool, a Turkish bath, sauna, Tropical Shower and a Vertical Hydromassage. Prices start at €84 per night. 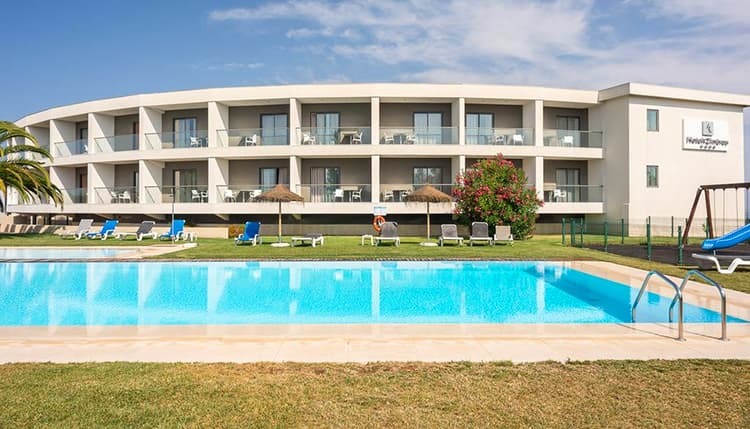 SANA Sesimbra Hotel is a four-star hotel in walking distance to the beach. A breakfast buffet is served daily. The hotel has an outdoor pool too. Prices start at €91 per night. Hotel do Mar is very close to the beaches and each bedroom has an ocean view and free wifi. Prices start at €63 per night. Cerca Da Vitoria 2 Apartments have a living area, air conditioners, wifi and TV. Most apartments include an equipped kitchen, while others include a kitchenette. Some apartments also come with a sea view. Prices start at €34 for two people per night in the low season. Casa Mateus is one of the best seafood restaurants in Sesimbra. It won a certificate of Excellence between 2015 – 2018. Address: Largo Anselmo Braamcamp 4. Another amazing seafood restaurant in Sesimbra is O Rodinhas. It also won a certificate of Excellence between 2015 – 2018. Address: Rua Marques de Pombal 25. A great Italian Restaurant is Ristorante La Villa. Prices range between €10 to €20. Address: Rua Heliodoro Salgado 3. Portofino Restaurante Bar is on the beach with lounge zone and overlooking the bay of Sesimbra. Serves vegetarian Friendly, Vegan Options & Gluten Free Options for €20 to €30. Address: Praia do Ouro, Avenida dos Náufragos 2970. As you can guess from the name, Burger O’Clock is a lovely place that sells the best hamburgers around all day long. Address: Rua Dr. Peixoto Correia 67. 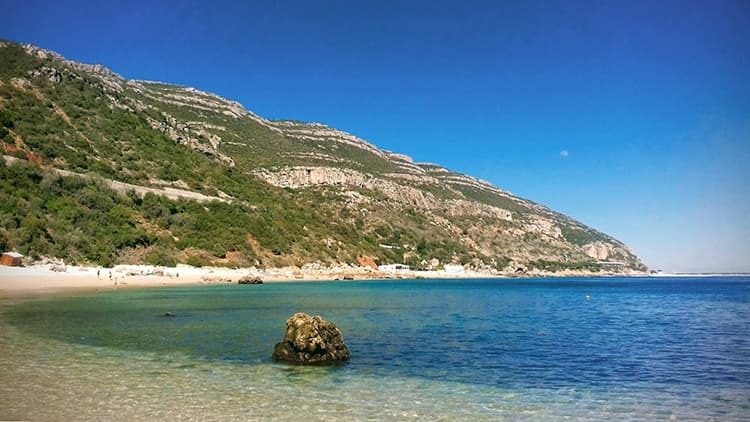 Explore the lush green, Mediterranean-like landscape of the Arrábida Natural Park and Sesimbra on an eight-hour tour from Lisbon. Choose to spend time on the golden beaches, taste local wines, or set sail in search of the resident dolphins. All this from only €60 per person. They will even pick you up at your hotel or apartment in Lisbon. To book this popular tour any time of the year, go to Get Your Guide here. We hope that you do visit Sesimbra. There is truly something for everyone although you’ll find it’s not an expensive area. We’re sure you’ll have an amazing time and that you’ll want to visit again! 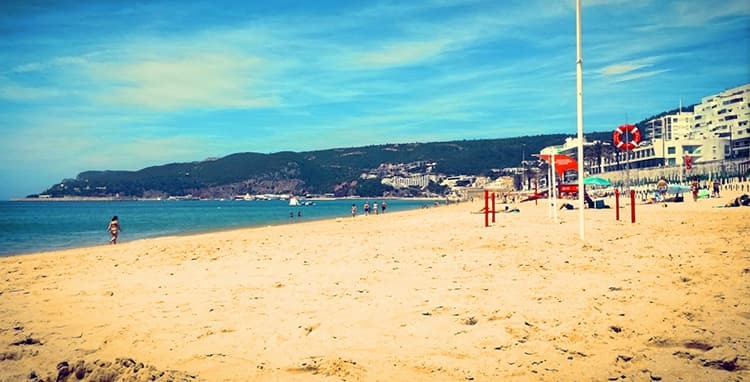 Let us know what you thought of Sesimbra in the comments below. Laura moved to Portugal in 2002 where she studied at the local school in Ansião - Leiria. She is both British and Portuguese and fluent in both languages. She works for a local building company and also looks after holiday lets. As she likes to be busy she is also studying for a degree in languages with hopes of becoming an official translator in the future.